Published on September 22, 2013 by Martyn. Be the first to comment! I’ve always had a soft spot for the Ilkley Literature Festival – and not just because it takes place in my adopted home town. 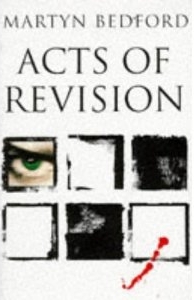 The festival, which opens on Friday October 4th, celebrates its 40th anniversary this year and my associations with it go back as far as 1996, when I gave a reading from my debut novel, Acts of Revision. It was my first festival appearance and only the second time I’d read my work before an audience (the previous time had been at the Muswell Hill Bookshop, in London, in front of about thirty people). At ILF, nearly 100 people filled a room at the Craiglands Hotel to see me share a stage with Stan Barstow, author of the classic novel A Kind of Loving and one of this country’s leading writers in the 1960s and 70s. To be truthful, at least 90 of those in the room were there to hear Stan read from his autobiography and the rest of the audience were made up of my parents, my wife and a handful of friends. I was nervous as hell. If it hadn’t been for the lectern, my hands would’ve shaken too much for me to hold the book steady enough to read. To make matters worse, I’d realised as the audience took their seats that most of them were of a certain age and, not only were they there to see Stan Barstow, they might not appreciate me reading the passage I’d rehearsed and which was littered with swear words. So, in the minutes before the compere introduced us, I nipped into the loo, locked myself in, and frantically thumbed through Acts of Revision for a ten-minute excerpt with no effing and blinding, no graphic violence, no “scenes of a sexual nature”. Reader, I couldn’t find any. Then, when my turn came to read, I noticed that – right in my line of vision whenever I looked up from page – one of the older members of the audience had fallen asleep in his seat and would periodically nod awake with a jolt. As if that wasn’t enough, at the Q&A session at the end one of my ‘friends’ sent me a real curve-ball by asking if I thought the novel was dead as an art form. Yeah, thanks mate. You know who you are. With the passage of time, though, that event has been transformed into a fond memory. In part, I think, because my parents were so proud to see their son on stage, reading from his novel; in fact, it was the last time I saw my Mum when she was well – not long afterwards, she became ill with cancer and died within a few months. I also remember Stan Barstow fondly for his graciousness towards me that day. As a novelist, it was my first festival gig of many and so I’ve come to associate ILF with the beginning of my public career as a writer . . . and am grateful for the lessons I learnt that day about how not to perform my work. I’ve taken part in a number of very enjoyable events and workshops at Ilkley since then and was, for a few years, on the festival’s board of management. In recent years, under the brilliant directorship of Rachel Feldberg, ILF has grown beyond all recognition to become one of the leading festivals on the circuit behind the big three of Hay, Cheltenham and Edinburgh. 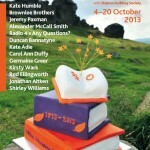 The 2013 programme includes more than 250 events for readers and writers of all ages, spread over 17 days and including some of the top authors from Britain and abroad. Click here to go to the Ilkley Literature Festival’s website for full details.